This quickstart walks through how to create an Azure SQL Database managed instance in the Azure portal. For limitations, see supported regions and supported subscription types. The following steps show you how to create a managed instance. 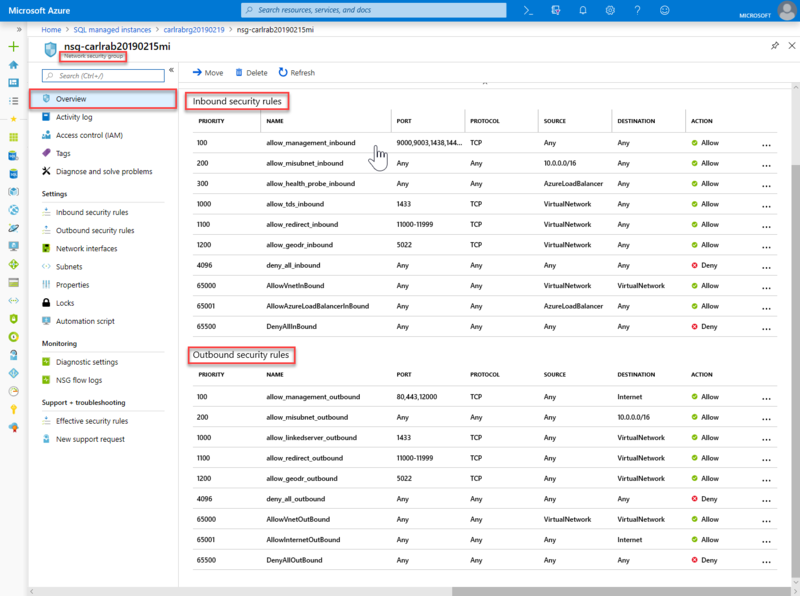 Locate managed instance and then select Azure SQL Managed Instance. Managed instance name Any valid name For valid names, see naming rules and restrictions. Managed instance admin login Any valid user name For valid names, see naming rules and restrictions. Don't use "serveradmin" as that is a reserved server-level role. Password Any valid password The password must be at least 16 characters long and meet the defined complexity requirements. Collation The collation that you want to use for your managed instance If you are migrating databases from SQL Server, check the source collation using SELECT SERVERPROPERTY(N'Collation') and use that value. For information about collations, see server-level collations. Location The location in which you want to create the managed instance For information about regions, see Azure regions. Virtual network Select either Create new virtual network or a valid virtual network and subnet. If a network/subnet is unavailable it is must be modified to satisfy the network requirements before you select it as a target for the new managed instance. For information regarding the requirements for configuring the network environment for a managed instance, see configure a VNet for a managed instance. Connection type Choose between Proxy and Redirect connection type For more information regarding connection types, see Azure SQL connection policy. Resource group A new or existing resource group For valid resource group names, see Naming rules and restrictions. To use the managed instance as an instance failover group secondary, select the checkout and specify the DnsAzurePartner managed instance. This feature is in preview and not shown in the accompanying screenshot. Select Pricing tier to size compute and storage resources as well as review the pricing tier options. The General Purpose pricing tier with 32 GB of memory and 16 vCores is the default value. Use the sliders or text boxes to specify the amount of storage and the number of virtual cores. When complete, choose Apply to save your selection. Select Create to deploy the managed instance. Select the Notifications icon to view the status of deployment. Select Deployment in progress to open the managed instance window to further monitor the deployment progress. For the first instance in a subnet, deployment time is typically much longer than in subsequent instances. Don't cancel the deployment operation because it lasts longer than you expected. Creating the second managed instance in the subnet only takes a couple of minutes. After the deployment completes successfully, review the resources created and retrieve the fully qualified server name for use in later quickstarts. Open the resource group for your managed instance and view its resources that were created for you in the create a managed instance quickstart. Select the route table to review the user-defined route UDR) table that was created for you. In the route table, review the entries to route traffic from and within the managed instance virtual network. If you are creating or configuring your route table manually, you must be sure to create these entries in the route table. Return to the resource group and select the network security group to review the security rules. Review the inbound and outbound security rules. Return to the resource group and select your managed instance. On the Overview tab, locate the Host property and copy the fully qualified host address for the managed instance for use in the next quickstart. The name is similar to your_machine_name.a1b2c3d4e5f6.database.windows.net. For an overview of the connection options for applications, see connect your applications to a managed instance. 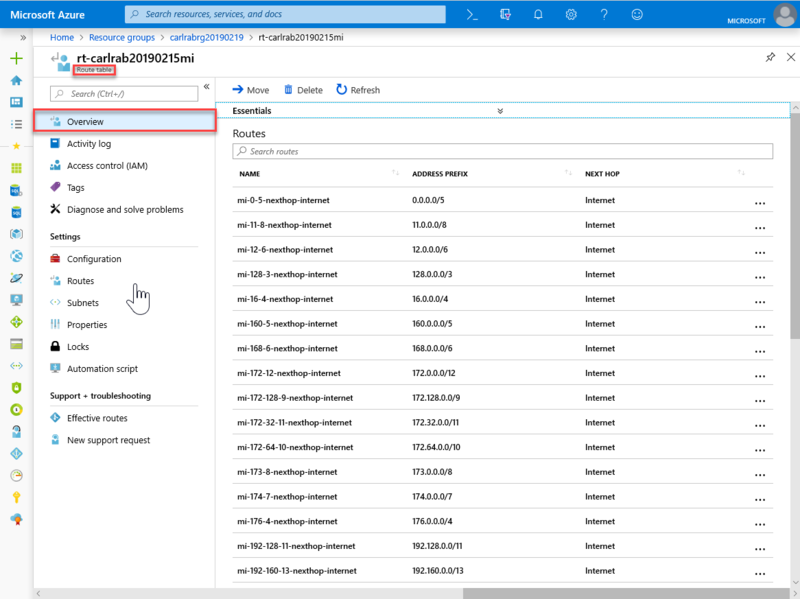 For a quickstart showing how to connect to a managed instance from an Azure virtual machine, see Configure an Azure virtual machine connection. For a quickstart showing how to connect to a managed instance from an on-premises client computer using a point-to-site connection, see Configure a point-to-site connection. 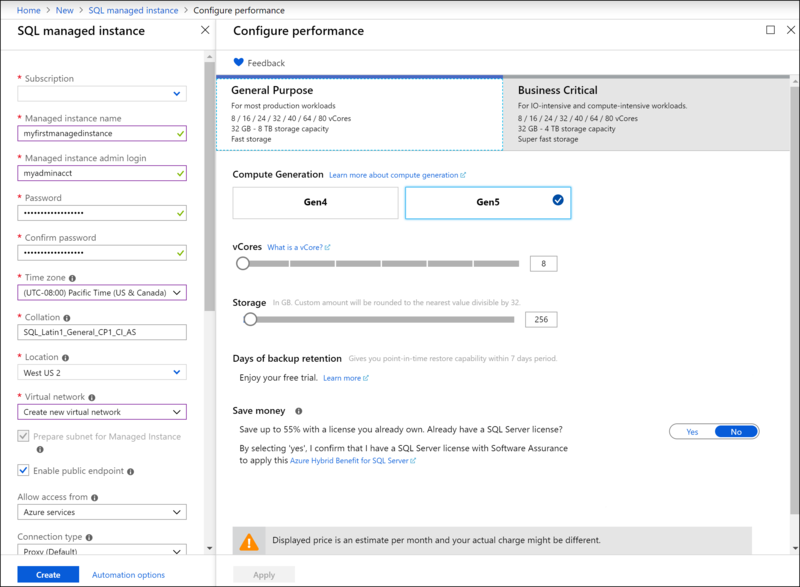 To restore an existing SQL Server database from on-premises to a Managed instance, you can use the Azure Database Migration Service (DMS) for migration to restore from a database backup file or the T-SQL RESTORE command to restore from a database backup file.